An endearing film, television and stage actor, John Goodman skyrocketed to leading man status on the strength of his meat-and-potatoes, regular-guy affability and easygoing charm. For eight years, he was a crucial part of the top-rated series "Roseanne" (ABC, 1988-97), playing Roseanne’s forthright husband and comic foil. And while he enjoyed mainstream success with “Roseanne” and box office hits “The Flintstones” (1994) and “Monsters, Inc.” (2001), he maintained an art house fan base as a perennial favorite in Coen Brothers movies like “Raising Arizona” (1987) and “The Big Lebowski” (1997). Huggably vulnerable but with an underlying strength and potential for rage, Goodman was an unlikely leading man possessing broad appeal, enormous range, and the respect of audiences, peers and critics alike. Over the next few years his average-working-guy looks paid the bills in a series of commercials, including a rather infamous one where he slapped his face with skin bracer and commented “Thanks, I needed that!” He moved up the ranks of the New York theater community with his 1978 performance in a disco version of “A Midsummer Night’s Dream” at the Equity Library. The following year he scored a slot on Broadway in “Loose Ends” and fell in with a crew of struggling actors (Bruce Willis, Kevin Kline, and Dennis Quaid among others) known for frequenting Café Central on the Upper West Side. Goodman was still eking out a living doing commercials when he auditioned for the notorious 1980-‘81 season of Saturday Night Live, though he failed to make the cut. Little did he know at the time that he would wind up hosting a dozen episodes of the show. In 1983, Goodman began to build serious career momentum. He landed on a road tour of the musical “The Robber Bridegroom” while making his film and TV film debuts with “Eddie Macon’s Run” (1982) and “Face of Rage” (ABC, 1983). He finally got the chance to show a large audience his enormous talents when he originated the role of Huck Finn's father in the Tony-winning Broadway musical "Big River" (1985-1987) at the Eugene O’Neill Theater. Goodman stayed with the long-running production until he was cast in his first sizable film role in David Byrne's stylized Texas comedy "True Stories" (1986). This led to another quirky Southwestern feature, the Coen Brothers comic gem “Raising Arizona” (1987), in which Goodman made a memorable impression as an escaped convict who tangles with a reformed stick-up artist (Nicolas Cage) over a kidnapped baby. That same year he and fellow Café Central patron Dennis Quaid shared the screen in the Louisiana crime caper “The Big Easy,” which would also mark the beginning of Goodman’s lifelong affair with New Orleans where he later met his future wife, Anna Elizabeth Hartzog. Meanwhile, during the mid-1980s, Goodman wrote and performed sketch comedy on the monthly radio show “Citizen Kafka” on WBAI radio in New York. Goodman was acting in a 1987 stage production of ''Antony and Cleopatra'' in Los Angeles when he was spotted by an ABC talent scout looking for a TV mate for comic Roseanne Barr. Goodman was perfect for the role of a good-hearted, working-class, Midwestern dad with a goofy streak and a penchant for beer and ball games. The show became a top of the ratings hit for its outstanding writing and performing, as well as its groundbreaking approach to sexuality, poverty and feminism. The role of Dan Conner was a career-making one for Goodman, who received a Best Actor Golden Globe Award in 1993 and seven Emmy nominations from 1989 through 1995, quickly establishing him as an in-demand supporting actor for features. In 1988, Goodman showed some dramatic range as the tragic Edward Lawrence in "Everybody's All-American,” then followed by playing the first of several salesmen roles of his career in “Punchline” (1988) with Sally Field. Goodman took a co-starring role in the successful Spielberg send-up “Arachnophobia” (1990) and reached top billing status the following year in the unfortunate dud "King Ralph," though he fared much better in a crucial supporting role as a creepy traveling salesman in the Coens' film fest hit "Barton Fink" (also 1991). He again received top billing – and critical kudos – for his bravura portrayal of baseball legend Babe Ruth in the sentimental biopic "The Babe" (1992). In 1993, Goodman starred in “Matinee,” a worthy albeit kitschy homage to 1950s B-movies, as well as a disastrous remake of "Born Yesterday" co-starring Melanie Griffith. For the live-action take on "The Flintstones" (1994), Goodman convincingly played cartoon icon Fred Flintstone as a flawed but basically good-natured oaf and devoted husband who succeeds despite his loudmouthed manner and co-dependent relationship with Barney Rubble (Rick Moranis). The summer blockbuster grossed $37 million its first weekend, making it the first film to truly benefit from Goodman's rising star power. By then a part-time resident of Louisiana, Goodman produced and starred in the TNT biopic of its infamous son, "Kingfish: A Story of Huey P. Long" (1995), earning himself an Emmy nomination for Outstanding Lead Actor in a Miniseries or Special. He also co-starred opposite Alec Baldwin and Jessica Lange in that year's TV remake of "A Streetcar Named Desire" (CBS), snagging his ninth Emmy nod. Fully devoted to the big screen post-“Roseanne,” Goodman was villainous in the film adaptation of the children’s book "The Borrowers” (1997), then was brilliant as irascible Vietnam vet Walter Sobchak in the Coen Brothers bowling crime caper "The Big Lebowski" (1997). After a “Saturday Night Live” appearance where Goodman performed alongside Dan Aykroyd as a new member of the reformed Blues Brothers, the two filmed a lackluster sequel to the original film, "Blues Brothers 2000" (1998), directed by John Landis. Following a role as a hyperactive paramedic in Martin Scorsese's "Bringing out the Dead," (1999), Goodman churned out a string of uninspiring features, including "What Planet Are You From?" (2000), "One Night at McCool's" (2001), and "Coyote Ugly" (2001). He managed to redeem himself as the one-eyed Bible salesman Big Dan Teague in "O Brother, Where Art Thou?" (2001), a Coen Brothers' retelling of Homer’s Ulysses set in the Depression. A voiceover role for "We're Back! A Dinosaur's Story" (1993) opened up a whole new line of work for Goodman – he subsequently voiced "Frosty Returns" (CBS, 1995), "Rudolph the Red-Nosed Reindeer: The Movie" (1998) and the series "The Pigs Next Door" (Fox Family). He began a relationship with Disney and voiced "The Emperor's New Groove" (2000), "The Jungle Book 2" (2003), "Clifford's Really Big Movie" (2004), and “Cars” (2006). His most memorable voice was that of the hulking, but soft-hearted monster James P. "Sully" Sullivan in the much-loved "Monsters, Inc." (2001) as well as its various sequels and tie-ins. In 2000, Goodman returned to series TV playing a gay single father sharing his home with another single dad in the short-lived Fox sitcom "Normal, Ohio" (2000), which earned him a People’s Choice Award for Best Actor. Back on the big screen, he had a supporting role in "My First Mister" (2001), an hysterical turn in Todd Solondz's "Storytelling" (2001) and another supporting job in the Bob Dylan-penned oddity "Masked & Anonymous" (2003). Following the off-Broadway Nazi drama "The Resistible Rise of Arturo Ui,” Goodman had an excellent run on 2003-2004 season of "The West Wing" (NBC, 1999-2006) as Glenallen Walken, a Republican Speaker of the House who temporarily relieves President Bartlett as Commander in Chief during a moment of personal crisis involving Bartlett’s daughter, Zoey (Elisabeth Moss). 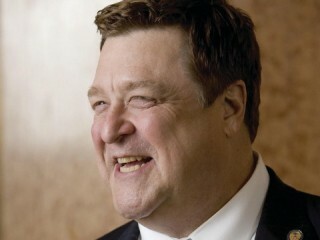 View the full website biography of John Goodman.